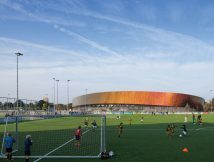 Sportcampus is a 33,000 m2 sports complex set in the centre of Zuiderpark, a large public park in The Hague. 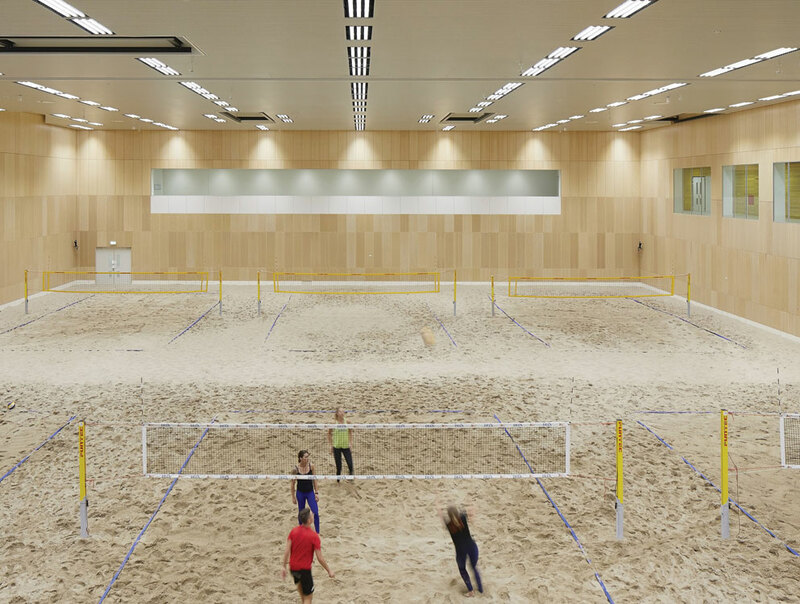 Covering indoor sports from basketball and football to beach volleyball and gymnastics, the facility accommodates The Hague University of Applied Sciences, ROC Mondriaan, and the wider community. 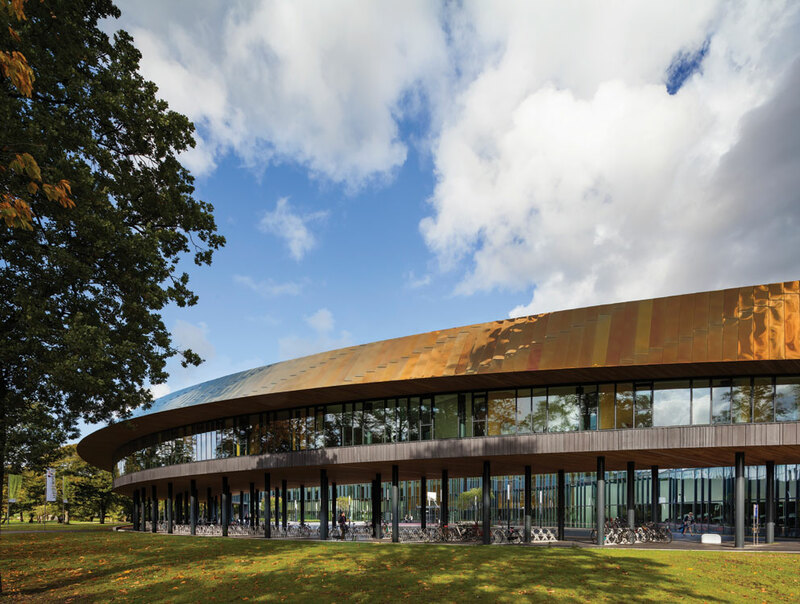 Project designers FaulknerBrowns Architects have created an asymmetrical ovoid to house the facility, surrounded by a ribbon of polished steel panels, creating dynamic reflections of the surroundings, including nearby greenery. 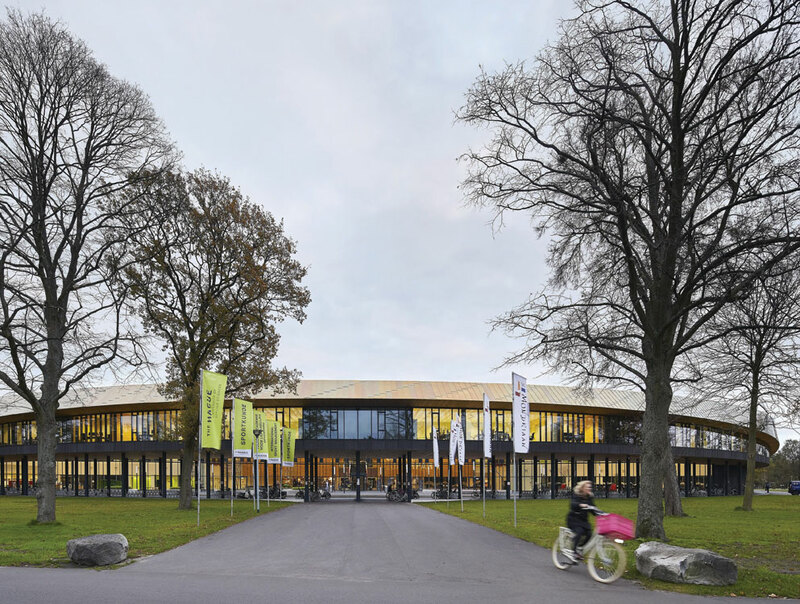 Given the brief of contributing to a “healthier society,” the architects worked closely with the client and the local community to construct a building that would allow the experienced and inexperienced to join together in a wide variety of activities, in one centre. 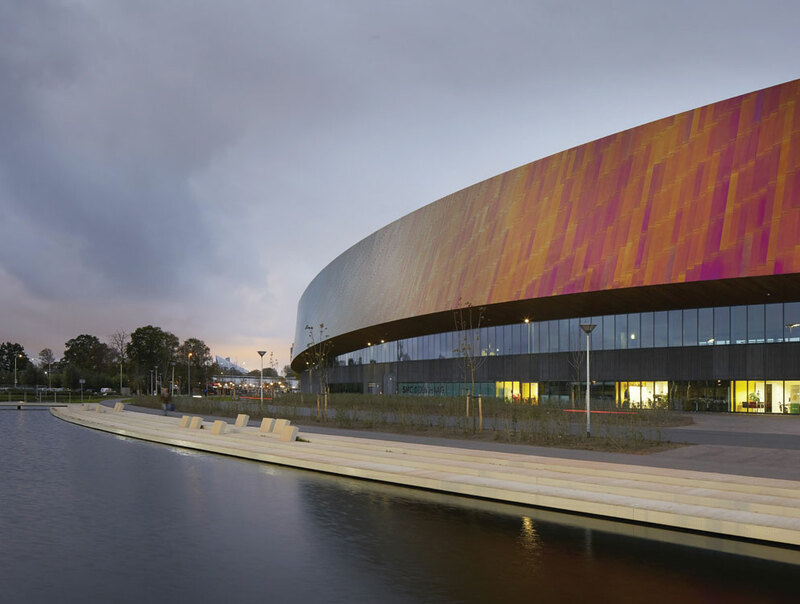 FaulknerBrowns Architects have been working in Holland for the past 25 years, with considerable experience building similar sports structures across Europe, including Netherlands projects Sportiom in Den Bosch and the National Velodrome at Apeldoorn. They were appointed to the Sportcampus Zuiderpark project through an EU tender and design competition. Originally the client was three-headed: the local housing association, the municipality of Den Haag, and The Hague University, the brief being developed by a combined working party. During the concept design stage, the housing association terminated its involvement, the lead being taken by the city and the university. 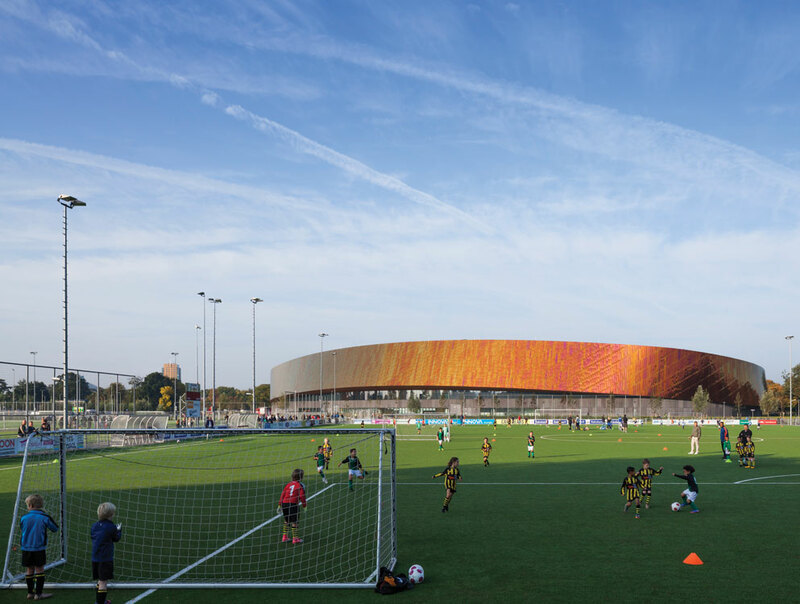 Completed in 2017, the project has already been shortlisted for Best Building of The Year in Holland, and will compete for the title of World Building of the Year at the World Architecture Festival in November. 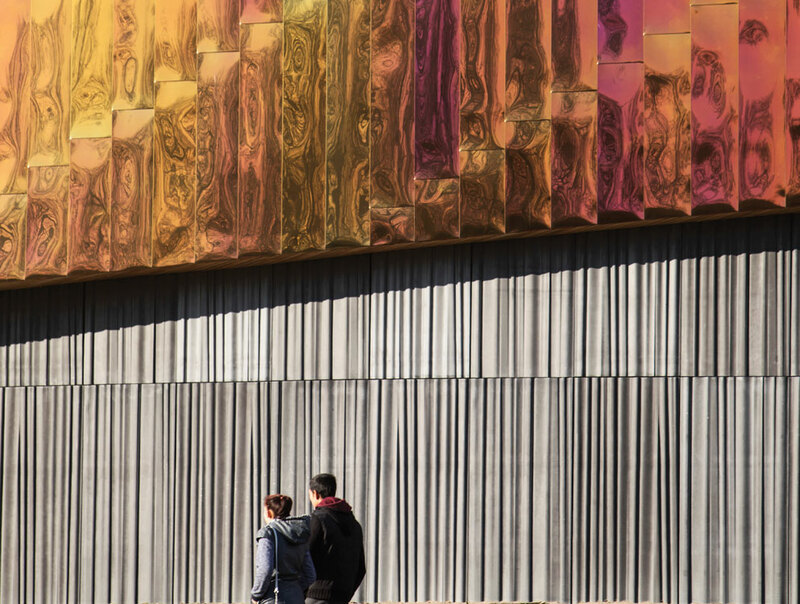 With its striking facade, inclusive design, and collaborative build, it is easy to see why the building has been so well received. 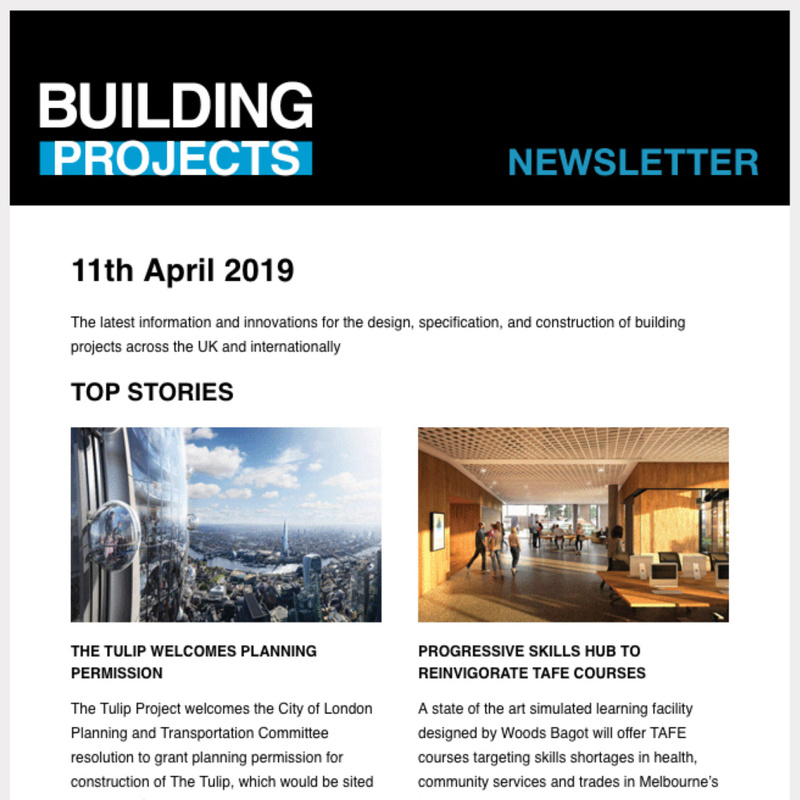 The collaborative nature of the project was established at an early stage, which according to Russ Davenport, partner at FaulknerBrowns Architects, was a real benefit when defining the project’s direction, as well as being tied into its community role. “Central to the brief was the wellbeing and health education of the community,” he tells ADF. 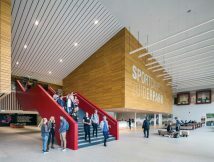 “The provision of a sports library, for example, was seen as an opportunity to engage athletes, students, and the broader public in the DNA of the building.” The building’s programme is split vertically, with the ground floor being a ‘private’ section, including the changing rooms and athlete areas, and the first floor generally being available to the public. The major elements of the structure have been brought together and placed end to end in the centre of the plan. According to Davenport, this was conceived to provide maximum flexibility in use, creating the opportunity to subdivide rooms into a variety of sizes, and accommodate various events. 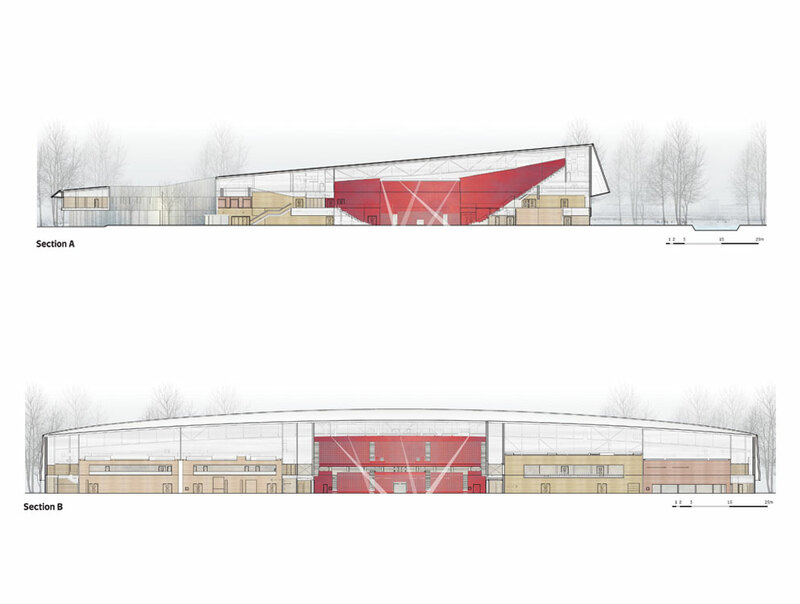 Level 1 covers four key spaces – an arena, ‘dry’ sports hall, beach sports area, and a gymnastics hall. 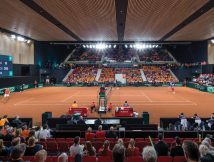 The central hall occupies the middle of the building, providing a 3,500 seat arena space. 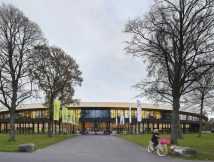 To one side is the multi-purpose sports hall, which is one of the project’s sub-dividable areas, able to transform into a number of smaller spaces using flexible walls, and large enough to hold 18 basketball courts when fully opened up. 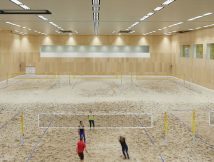 On the other side of the central arena is the beach sports area, which can be subdivided into two beach football courts or six beach volleyball courts. To the side of that is the dedicated gymnastics hall, with a variety of equipment and foam pits for practicing jumps. 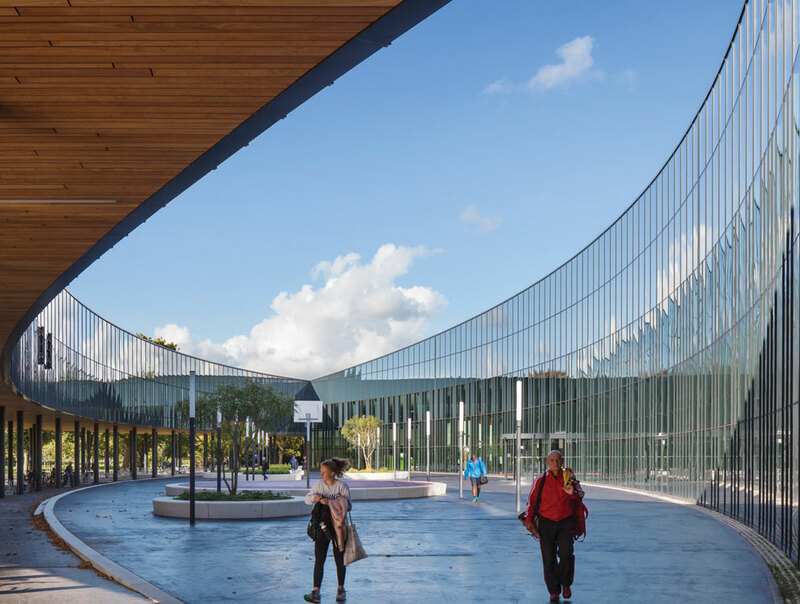 Extending over about 200 metres end to end, these spaces form a 50 metre wide strip that runs right the way through the building. The architect explains that flexibility was an early key design driver: “One of the original ideas behind the scheme was to try to have flexible walls between all those spaces, so that you could actually combine them together to create a totally flexible, multifunctional space.” He adds: “At the end of the day however, as the brief evolved it became clear that the environmental and acoustic requirements of each space would favour a greater degree of separation.” He explains some further benefits of placing the main spaces at the centre of the building, with the smaller volumes around them: “In many ways the reason those four main spaces were brought together was to place them in the middle of the scheme, so that the corners of the rectangular boxes don’t protrude. 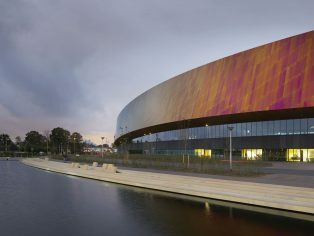 Then, in effect, the smaller spaces were arranged around the perimeter, allowing us to wrap this conceptual ribbon around them, tying them all together.” Another reason the main arena is placed in the middle is that it has the greatest height demand. 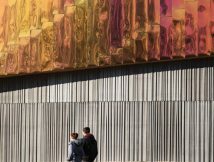 The building rises up on one side, and, says Davenport, “its highest point is dictated by the height of the tiered arena seating.” As well as the main areas, there are a number of smaller volumes which sit alongside. 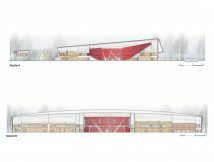 These include a dojo, dance areas, and four smaller sports halls (primarily used for the school during the day and the public during the evening). A sports science laboratory is also included within the building, with monitoring equipment and observation windows in order to engage with the ‘Sports hall of the Future’, which has a variety of built-in testing equipment such as pressure plates. 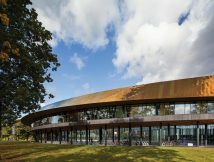 It was originally envisaged that there would be a hotel, with accommodation provided for private companies, including brands such as Nike and Asics. This was intended to facilitate the involvement of the companies in research, as well as provide a potential sales point. During the design stages however, this requirement was changed. Once the housing association dropped out of the project, a redesign process based on a reduced area was required. Despite this, a sports wheelchair maker currently have a workshop in the building, and use the laboratories for testing.